A mound of stones which might have been a part of the fortress. A Pahute Indian named "Narro-gwe-nap" or Keeper of the Tales related the following legend to William R. Palmer (1877-1960) who was an advisor and advocate to the Cedar City, Utah Pahute Indian tribe. In the early days, Rush Lake, Utah was a major travel route, watering hole and campground to the Indians. The lake was maintained by a spring that flowed from the point of the black hill. In recent years, Rush Lake has dried up - no doubtedly due to the lowering of ground water by wells in the area. As the Legend goes, the Indian Oonuput (That one) killed Shinob (The god of love) at Rush Lake. This caused Oonuput great shame and disgrace. The chief god Tobats swore to kill Oonuput. 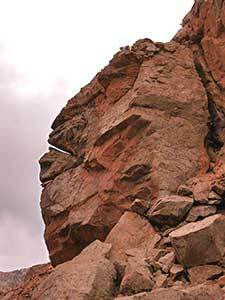 At Parowan Gap there is a rocky outcrop that has a human like appearance. 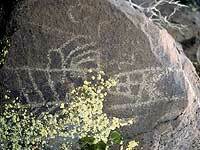 The Indians in the area considered it to be sacred for it was the profile of Tobats. Tobats built a small fortress on the top of the hill just east of the lake. (According to Palmer, a piece of the wall still stands.) Here Tobats waited for Oonuput to come for water so that he could kill him. Oonuput found out about Tobats plan of vengence and went to nearby water holes. After several days had passed and Oonuput had not come, Tobats decided to dig up all the water holes except for Rush Lake thus forcing Oonuput to come in for water. Tobats carried out his plan and all the water dried up except at Rush Lake. Several days later as Tobats was inspecting the valley below, he saw Oonuput wriggling through the brush trying to sneak in for water. When Oonuput reached the lake and started drinking, Tobats shot him through the back with an arrow. Oonuput died and turned to stone. William R. Palmer recalled that when he was a boy, he remembered seeing a large stone in the shape of a man with a hole in its back, lying at the water's edge. The stone was later broken up and placed into the rock fence next to the lake. After Oonuput was killed, a great darkness fell over the land. It was so dark that fires could not be seen. There was great fear and mourning among the people. During this time, the Indians began wandering off in different directions getting themselves lost in the darkness. Tobats went to the top of the hill and cried down to the people telling them to stay in one place, grasp each other's hands, and to gather into a group. He then told them to come up to the top of the hill and make a circle around him. 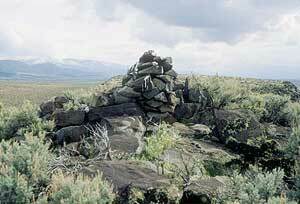 In traveling up the hill, the Indians formed a trail that according to Palmer was still there during his lifetime. After the people were gathered, Tobats took his quiver of arrows and began shooting them into the sky to see if the darkness could be penetrated. The arrows were made with feathers from different types of birds. After several attempts, Tobats picked up an arrow with Flicker feathers on it. The arrow pierced the sky and opened a small hole of light. When the arrow returned the feathers were streaked with red. Tobats then used an arrow with Magpie feathers. The arrow penetrated the darkness and light appeared. Upon returning, the Magpie feathers were streaked with white. Tobats called the Flicker bird to him. (At that time the Flicker bird had no red.) Tobats told the bird that from this time forth it would be streaked with red in honor of what it did. He then called the Magpie bird to him, which at that time didn't have white, and told the Magpie that it would be streaked with white in honor of what it did. These two birds were sacred to the Indians.